NEW DELHI. OCT.29: A seminar on 'Success Stories in Homoeopathic Practice' was organised by Central Council for Research in Homoeopathy at headquarters , aimed to bring to light the commendable work of the homoeopathic doctors in various challenging medical cases. Dr. S. K. Panda, Joint Secretary, Dept. of AYUSH, was the chief guest at the event, while Dr. Diwan Harish Chand, former Advisor (Homoeopathy), Govt. of India and Dr. Ramjee Singh, President, Central Council of Homoeopathy were the guests of honour. More than 30 homoeopathic researchers, practitioners and educators from various research institutes and homoeopathic medical colleges attended the workshop. Prof. C. Nayak, Director general, CCRH, extended a warm welcome to the guests and participants. The seminar was split into various scientific sessions on rare, acute and long cases, which were chaired by various homoeopathic physicians. 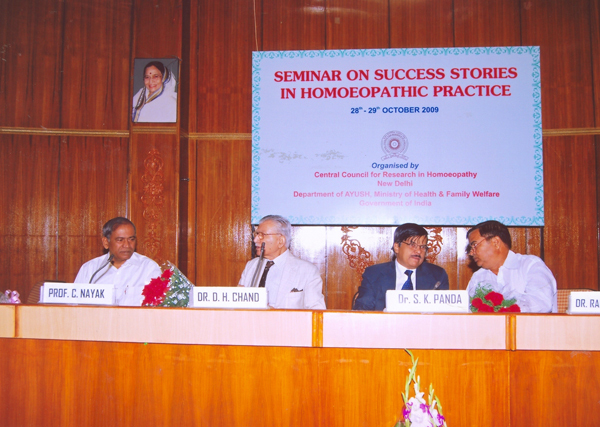 Many skilled homoeopathic practitioners and researchers shared their success stories with the participants. The concluding session of the seminar was taken up by Prof. C. Nayak, Director General, He shared with the audience the importance of case studies in homoeopathic practice and made a presentation on 'Case Report Writing'. Two publications of the Council, namely 'Monograph on Kalimuriaticum' and 'Database of Homoeopathic Publications (along with its CD)' were released by the guests on the occasion.